Сейчас идет снег в Gran Sasso ?Thank you! Gran Sasso (The Great Stone) is the most famous climbing spot in the Apennines, located 150km away from Rome in the heart of Abruzzo. It is a magnificent rocky limestone summit offering views you would usually associate with the Alps. Gran Sasso is also a free ride paradise with dozens of 1000-1400 m drops in untouched powder. No pistes here. Access is by the Fonte Cerreto cable car where you disembark at 2135m and climb a further 250m to the Duca d'Abruzzi refuge (2385m). 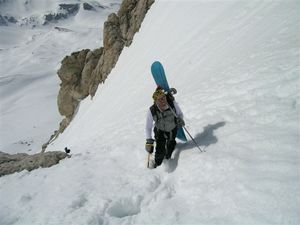 Skiing at Gran Sasso, much of it steep and pretty extreme (crampons/axes required), is from December to late May, even June and vertical descents of up to 1400m are possible.